My Karaoke Rainbow is spun! 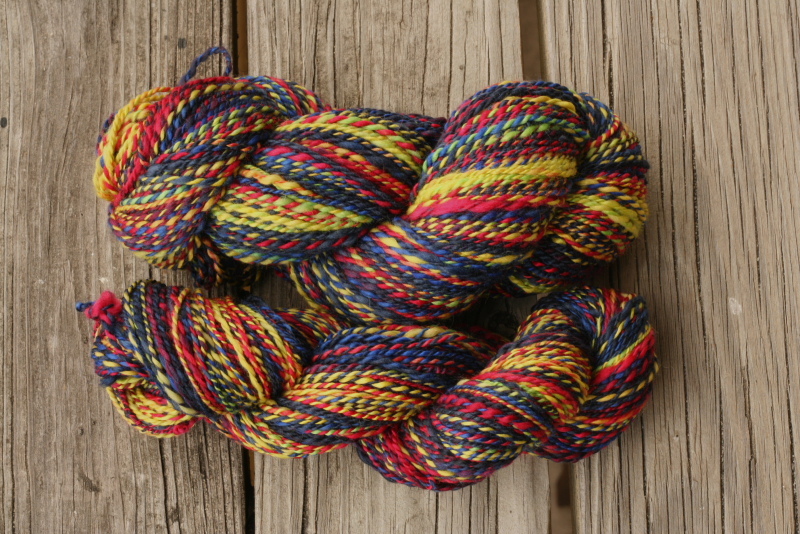 I decided at the midway point not to make the standard two ply marbled yarn but to go with handspinning a fractal yarn. 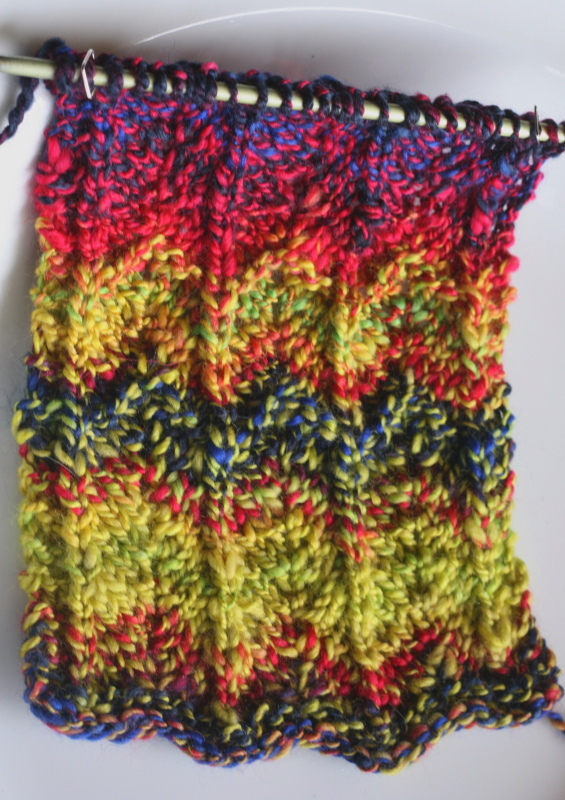 Fractal spinning is how I turned this hot mess of color into this (WIP) scarf. It doesn’t require any special spinning skills at all. In fact, its all in how you prep the fiber. A fractal is a pattern that repeats no matter how far you zoom in or zoom out. Its a pattern within a pattern. The Fractal Foundation has this neat little gif that sums it all up. But don’t look for too long. So what does that mean for handspinners? It means that you spin one ply to be a long color repeat and a second ply to be a short color repeat. Then you ply those two together. The first ply is (say for example) Color A-Color B- Color C in loooooooog stretches. Think Noro Kureyon. 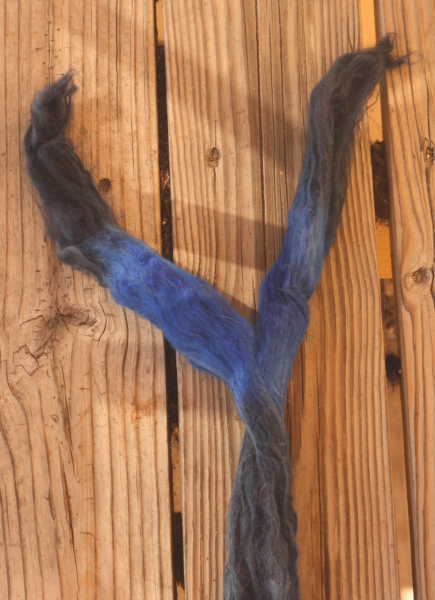 The second ply is the same sequence of Color-A-Color B-Color C but in much shorter stretches. Think any variegated hand dye. Its the same color pattern just at different scales, like those triangles up there that are making me dizzy. Let me put some white space in here. 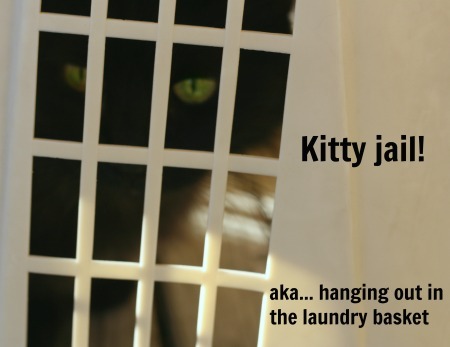 1) I split the roving lengthwise and put each half into a kitty-proof container. 2) Then I took one half and spun it up. 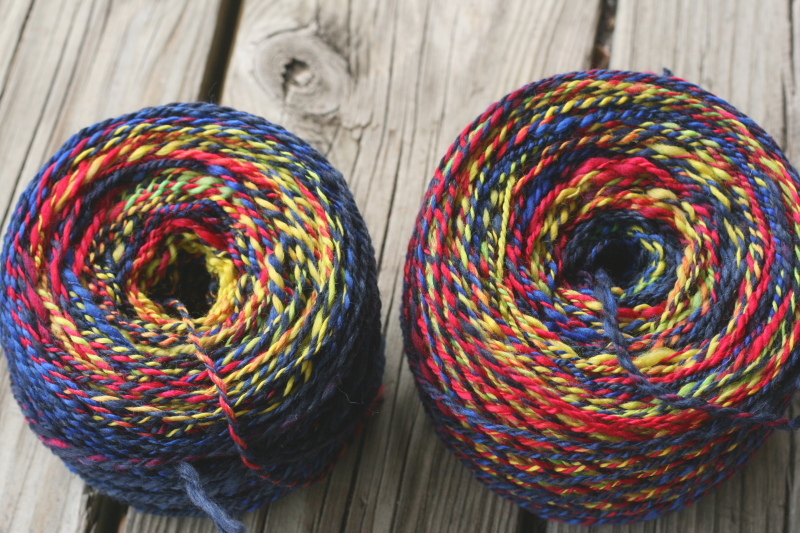 It has to be spun worsted. (That’s worsted style, not worsted weight.) 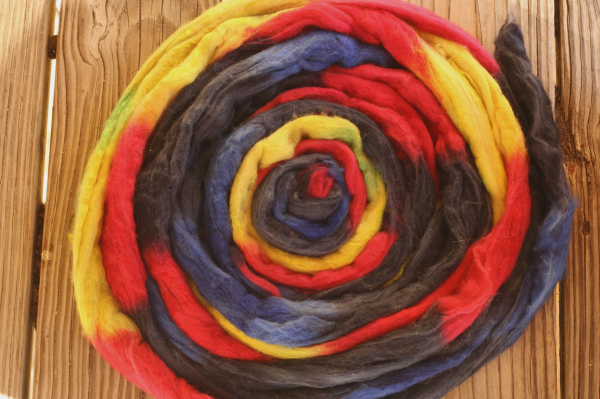 Hold the roving so that the fibers are inline with the draw. 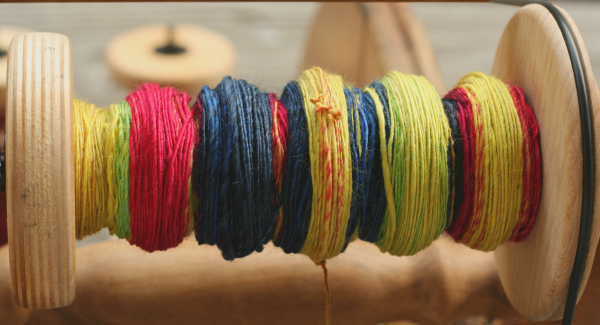 If you spin woolen, with the fibers perpendicular to the draw, the colors will blend and get out of sequence. 3) Then I took the second half and split it four ways. I made it into a pencil roving . The containers are important not just because they keep wicked little back cats from playing with the roving but because they preserve the color sequence. You want to spin each of these from the “start end” to the “finish end” and and not get them mixed up. And yes I eat a lot of yogurt. 5) Then ply the two together! See? No special skills required. Its all about splitting the roving and having enough yogurt containers. The magic of this yarn doesn’t reveal itself until you knitting it up and I’ve only just started. As you can see I started in a “mostly yellow” section. One ply is all yellow while the second ply cycles through the colors. Then I have a short “mostly pink” section. I’m just getting into the “mostly blue” section. I hope that’s enough to demonstrate the effect this yarn gives. Its less like color stripes and more prismatic. I love it. 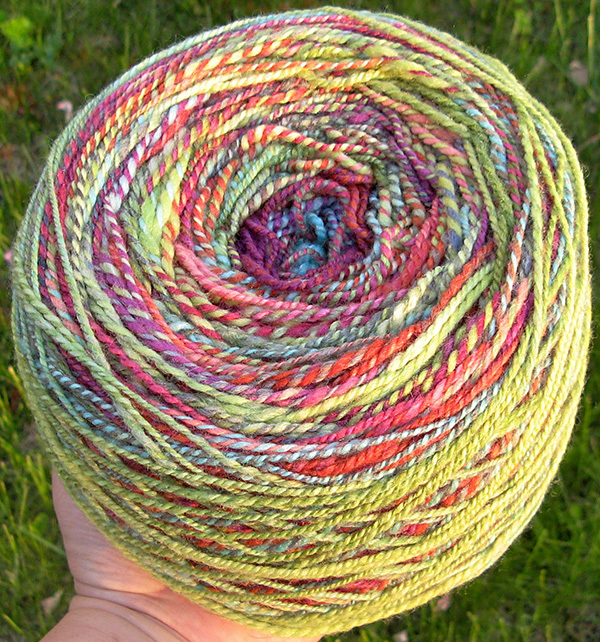 I love making handspun yarn that doesn’t look like anything you can buy in a store. 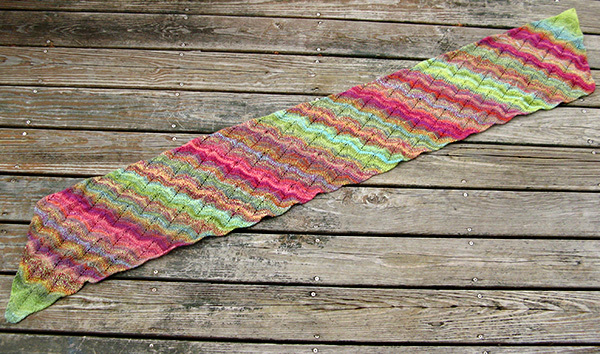 ***UPDATED*** You can see the finished scarf and get a copy of my Free Pattern for Ripplet. Want to know more about fractal spinning? Of course you do! Its gorgeous! 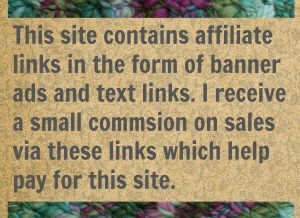 Knitty.com is a good place to start. 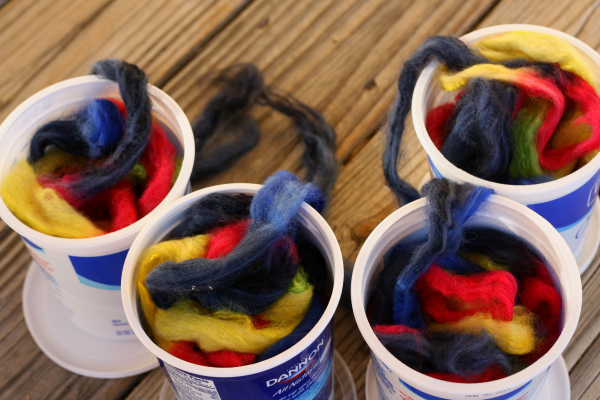 ♦ Here is their article explaining how to make a fractal yarn. Its says pretty much what I say here (there ain’t much to fractal spinning) but in a different way. That can be helpful. See? See how it works up? 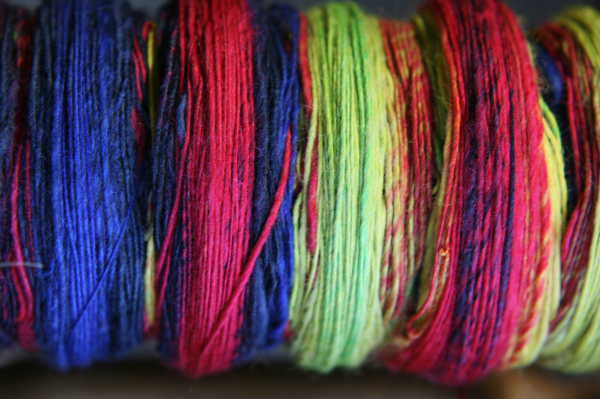 You have to love that and if you spin you can make as much fractal yarn as you want. I recommend Turkish Drop Spindles for beginners, fyi. Just in case you find yourself browsing online for one. For whatever reason. 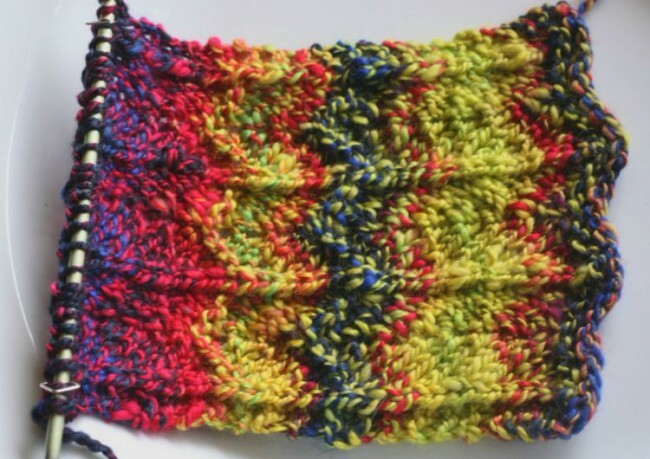 12 Comments on "Handspinning a Fractal Yarn – How to do It"
This is brilliant! Thanks so, so much; can hardly wait to make some. I would love to know more about beginner spinning. I took a seminar (one hour) last year, and I just have not picked it up yet. I am starting to think that maybe a wheel would be a good idea for me, but I would love to see more tutorials as I keep trying! Hmm… That has me thinking about rounding up some of the better on-line resources for handspinners. I didn’t listen. I stared at the gif too long, and now I think my brain is broken, lol. Plus, I just learned more than I can handle. Anyways, awesome yarn! 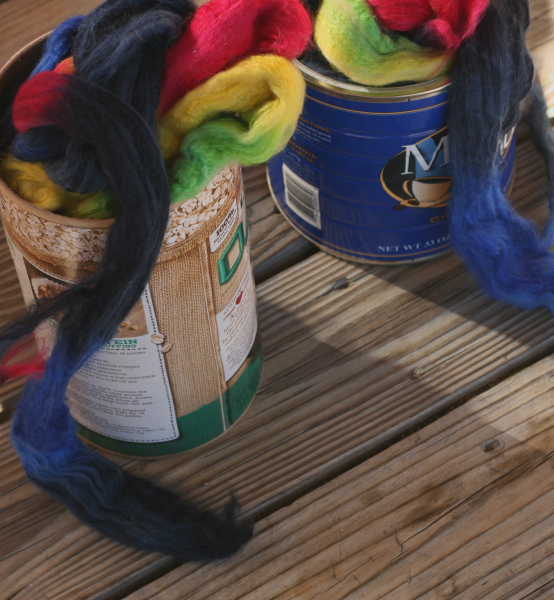 I saw something on Ravelry for how to make a spinning wheel for about $7. That + this post = Now I don’t have any excuses and I’m gonna have to take up spinning again! Thanks! That fractal gif totally has the power to break brains! It gave me a headache. $7 for a wheel??!! If you can find it again, please share. I’m avoiding my new (to me) wheel because I’m such a klutz. I gave up on the drop spindle for the same reason! I need to find the Tao of spinning so I can do stuff like this. Thanks for the inspiration! The Tao of spinning… There should a book with that title. If you keep at it you will find your groove. I hope you do. Spinning is something I enjoy but its so solitary and I have very few people I can share it with. Thus the goal to turn everyone on the internet into spinners! I love it. I must dig in the stash to see what roving I have. 🙂 Thanks so much for sharing this! Oh good! Can’t wait to see what you come up with.